In totally ‘tweet‘ worthy news, Yellow Label Kids just released the world’s most adorable bird rattle set! 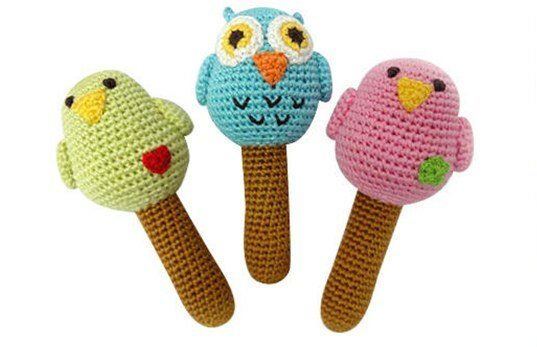 Handk nit with organic bamboo yarn, this sweet little set includes three colorful bird rattles in pink, blue and green. Each bird offers a gentle rattling bird song when shaken by your baby. Rattles were designed in San Francisco, but made with Fair Trade Standards by artisans in Bangladesh. These baby rattles are surface washable only to preserve the quality of the organic bamboo yarn, but you can gently spot clean with a damp cloth and air dry. These precious organic rattles are affordable and perfect for your own baby or would make an excellent baby shower gift!